Like the memory of a loved one that never fades the Day Of The Dead has survived for centuries. It changed and evolved over time, but it never vanished. The Spaniards learned that when they arrived in central Mexico in the 16th century. In Mexico, loss of life is a transition to a new existence. To help the loved, family members put personal positions of the deceased person in their casket. Things they will needed in the afterlife. Even a favorite pet might be in the casket to accompany their masters on their long quest. The Spaniards viewed the ritual started by the Aztecs some 3,000 years before as sacrilegious. They attempted to stop it, but couldn’t. Not only did it survive, it thrived, moving from southern Mexico and spreading north. It also merged with elements of Christianity. While first celebrated in summer, the date of the celebration moved to Nov. 1 and 2 of each year. That made the Day of the Dead celebration coincide with All Saints Day and All Souls Day. The All Souls Procession in Tucson began in 1990. A local artist, Susan Johnson, was grieving the loss of her father. Johnson had heard of the Dia de los Muertos or Day of the dead years before. The joy of the celebration inspired her. So she decided to celebrate her fathers life in a similar fashion. A few close friends and performing artists joined her. They created art from the day of the dead history and their own rituals. What began as a small personal celebration is now a huge gathering of Tucsonans each year. Tucson holds an ALL SOULS PROCESSION every year on the first weekend of November. Get a flavor of how Tucson celebrates the Day of the Dead in the brief video. Day of the Dead history goes back thousands of years. In pre Columbian periods the Day of the Dead, or El Día de los Muertos, was celebrated in Mexico and other Latin countries. The belief is that the gates of heaven open at midnight on October 31st. With that, the spirits of all deceased children reunite with their families for 24 hours. On November 2nd, the spirits of the adults come down to enjoy the festivities prepared for them. Homes in villages and towns have build alters to the departed. Decorations include candles, flowers and lots of food. Water, candy, and toys for deceased children. For adults spirits, cigarettes and shots of mescal adorn the alter. And small folk art skeletons and sugar skulls are the final touches. In small towns and villages the people may spend one or two months wages on the celebration. Every year. They believe happy spirits will provide protection, good luck and wisdom to families. On the afternoon of November 2nd, the festivities move to the cemetery. People clean tombs, play cards and listen to music. And of course, reminisce about their departed loved ones. It’s really a very extraordinary ritual. The Day of the Dead provides the living time to think about their departed family members. Usually, when people hear about the Day of the Dead for the first time they are shocked. They envision a ghastly, frightening, scary, dreadful or sorrowful. Almost nothing could be more incorrect. Specifics of the celebration will vary by region. But one aspect of the Day of the Dead seems common. Building intricate altars to greet and welcome bygone spirits home. Vigils are held and families frequently go to cemeteries to place flowers and ornaments on the graves of departed relatives. Celebrations will often feature traditional foods including pan de muerto or “bread of the dead”. Most often the food item will contain a miniature skeleton. 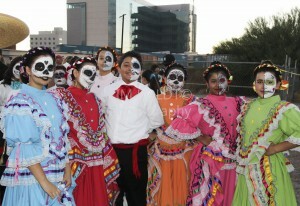 Participants will dress in special Day of the Dead costumes. Mexico celebrates this special day On November 1st and 2nd. Two locations where this ritual is specially impressive: Mixquic, a small town in Mexico City, and in Janitzio, a charming little island in the state of Michoacan. Tucson, Arizona is a place with strong Mexican history. So, it’s no surprise, the Day of the Dead is celebrated the first weekend in November each year. The celebration is held on the week end close to November 1st and 2nd each year. Parades, Day of the Dead costumes and other festivities are all part of Tucson’s Day of the Dead history. For more on the Day of the Dead Festivals in Tucson go to All Souls Procession website. This celebration is becoming popular in the U.S. Reasons for celebrating the Day of the Dead in the U.S. are unknown. Could it be a fascination with its mysticism or an excuse to party? Are you thinking how great it would be to retire in Arizona OR to experience the Tucson lifestyle? We can help!